My Metro Medallion top seriously came together so quickly. The blocks themselves are fairly large (13.5 x 16.5) and it felt like I just sat down to sew a few blocks together and suddenly I had the entire top! I love when things work out that way. I waffled about the corner triangles, especially when I realized that the pattern directions call for cutting left- and right-facing triangles to get the neat diamond shapes and I disregarded all rules of geometry and cut all right triangles. So then I had to go back and cut out the correct triangle shapes. But it looks much nicer this way! And I managed to fit one entire octopus on one block. Sadly, the other’s tentacles seem to be across some sort of dimensional portal. 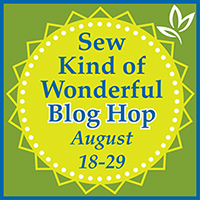 Welcome to my stop on the Sew Kind of Wonderful Blog Hop! 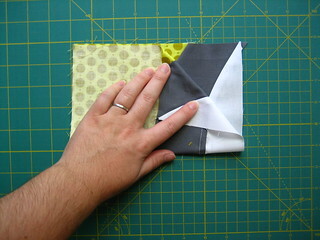 When I started quilting, I appreciated the ability to be precise in cutting fabric. 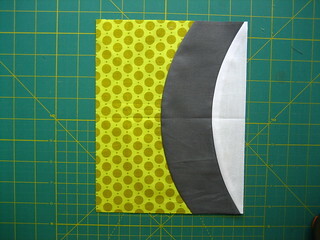 When a pattern calls for a 3″ square, I can cut a precise square using rulers, a mat, and a rotary cutter. Curves kind of wigged me out because they seemed so… imprecise. 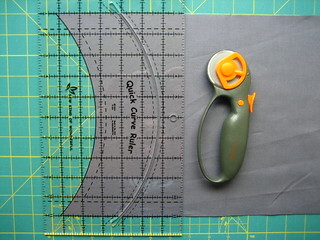 Enter the Quick Curve Ruler, a tool that makes cutting curves downright scientific. The ruler has a curved slit and is marked with a quarter-inch grid as well as curve guides, which helps with lining up and trimming blocks. 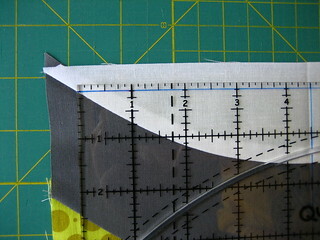 If the fabric is the right size and shape and the ruler placed properly, every curve will be almost exactly like every other curve. Precision! Jenny Pedigo at Sew Kind of Wonderful kindly provided the Metro Medallion pattern and I dove right in. 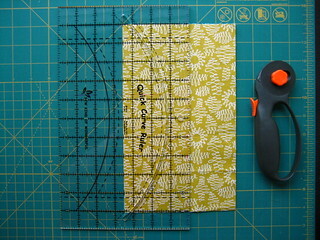 I cut all my rectangles and lined up the QCR and began to cut curves. 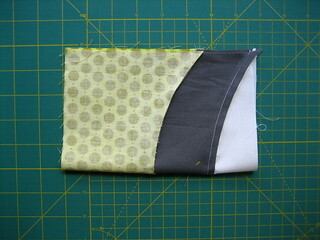 Both small almond piece and larger piece are used in this pattern, which means there’s very little waste. 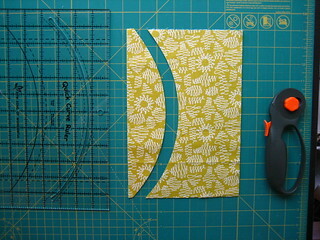 The curved edge pieces are cut in a similar way, but this time, the previous curve cut is lined up with one of the curve guides marked on the ruler. Cutting fabric for Metro Medallion seemed to take less time than cutting for Metro Rings and before long, I had neat piles of all pieces needed for the pattern. After a bit of chain piecing, I had all my block components ready for trimming. 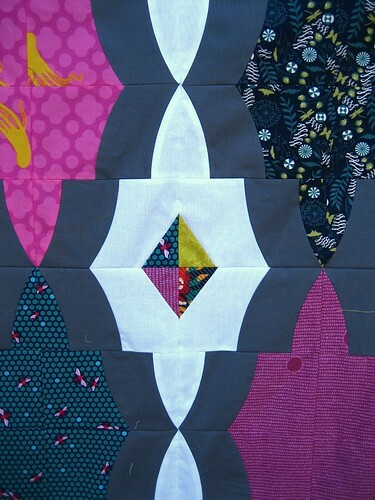 When I was piecing Metro Medallion, NaNa suggested marking the QCR’s 1/8” line for ease in trimming. I also marked the 4.5 line on the ruler and folded my component blocks in half, lining up the curves, to mark the center of the block. 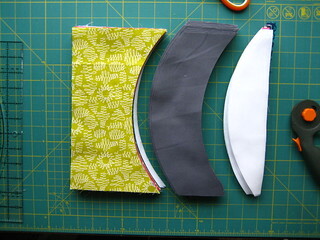 To trim, I lined the fold up with the marked 4.5” line on the QCR and made sure the curved seam lined up with the 1/8th” line. This makes sure that the curve points don’t get cut off – not a big deal in the Metro Medallions pattern, but I still want to be precise. 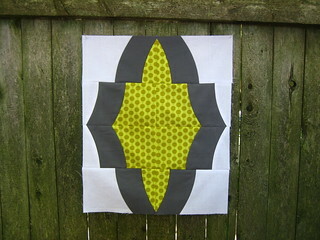 And here’s the first finished block! 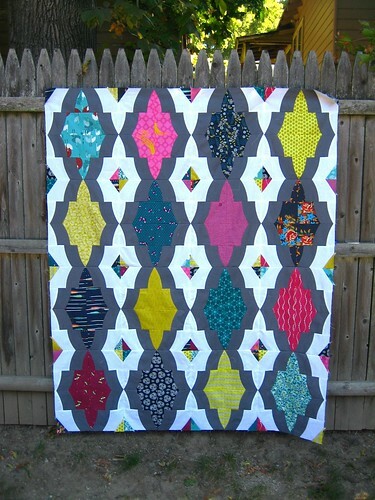 The pattern also has a variation with corner triangles; I’m going to sew those on once all blocks are complete to make sure colors are balanced. 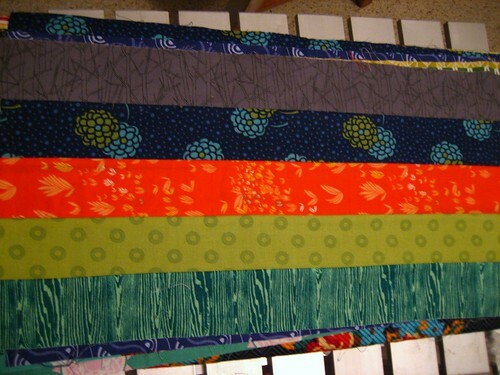 I’m looking forward to sewing up the top, so many of my favorite fabrics are represented. I may have to keep this one for myself! Please go and check out Jenny’s blog and shop. 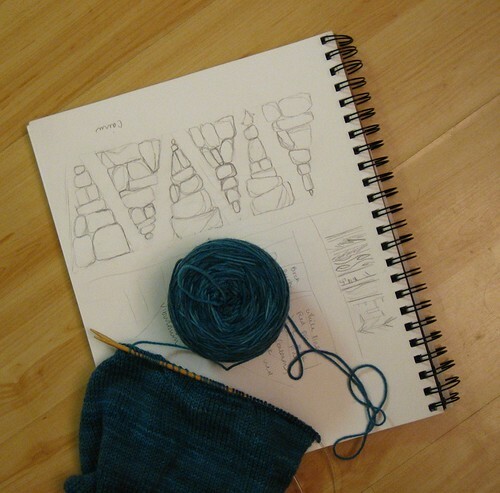 You can also join the Sew Kind of Wonderful mailing list to get news of any new patterns or promotions. 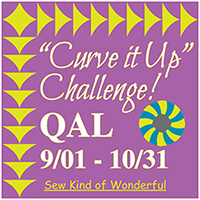 There will be a linky party on the Sew Kind of Wonderful blog starting tomorrow for any quilt or block made with the Quick Curve Ruler. The party will run through 31 August. 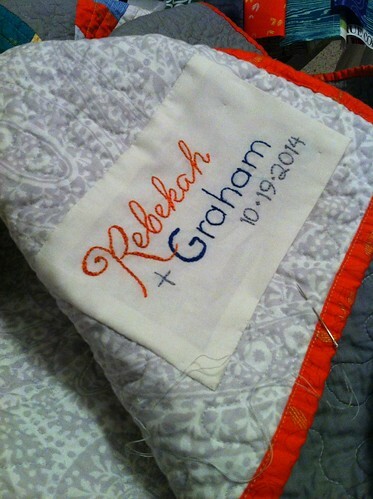 If you haven’t tried a QCR project, I believe Elizabeth will be hosting a giveaway tomorrow! And for more inspiration, check out #SKOWBlogHop on Instagram and the rest of the posts in the hop! 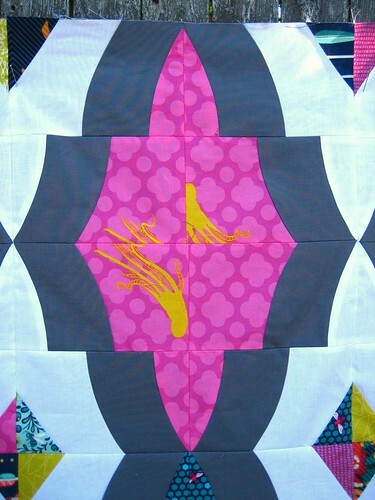 The bloghop is going to be followed by a ‘Curve it up’ Challenge Quilt-a-long on the Sew Kind of Wonderful blog starting in September, so join in the bloghop, get inspired and get ready to Curve It Up! 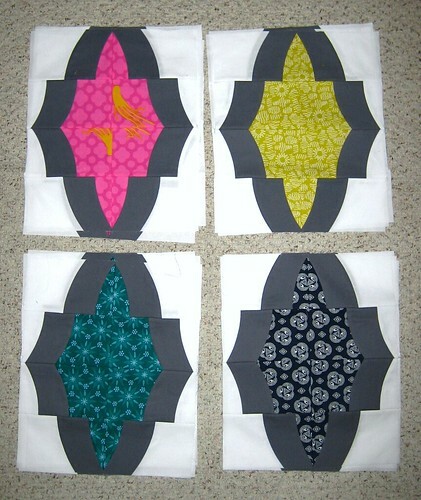 Disclosure: this post was sponsored in part by Sew Kind of Wonderful; I received the Metro Medallions pattern for free. My opinions are my own and based on my experience with the products.